(Photo: Evangelical Lutheran Church of Finland)Evangelical Lutheran Church of Finland peace message to Donald Trump and Vladimir Putin on July 16, 2018. 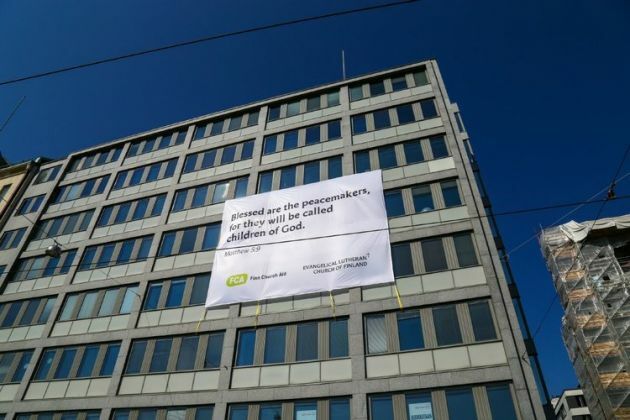 As U.S. President Donald Trump met with his Russian counterpart Vladimir Putin in Helsinki, the Evangelical Lutheran Church of Finland and its diaconical arm Finn Church Aid sent him a strong message of peace from a building near the presidential meeting place. A sign hanging on the side of the FCA headquarters - very close to where the July 16 Trump-Putin summit occurred read: "Blessed are the peacemakers, for they shall be called the children of God." Taken from the book of Matthew 5:9, the FCA and ELCF chose this these words to make known the church's stance on society and decision-making, the World Council of Churches reported. "The mission of the church and Christians is to act for a better and fairer world, and to pray for the realization of all kinds of peace as a community," said Laura Arikka, a member of the Lutheran church's board. "It is also important to pray for those who have the opportunity to influence things locally and globally." The meeting created confusion in the United States and Trump was condemned as "treasonous" for siding with the Kremlin over his own government agencies after a stunning joint appearance with Putin in which he seemingly accepted the Russian leader's denial of election meddling, The Guardian reported. At a joint press conference after one-on-one talks lasting more than two hours in the Finnish capital, the Trump offered no criticism of Putin or the cyber-attacks that the U.S. intelligence community says he coordinated to help Trump's 2016 election campaign. "They said they think it's Russia; I have President Putin, he just said it's not Russia," Trump told reporters. "I will say this: I don't see any reason why it would be. I have great confidence in my intelligence people, but I will tell you that President Putin was extremely strong and powerful in his denial today." The Guardian said the comments set off a new firestorm in Washington and critics suggested it was a historically weak performance by a U.S. president against a foreign adversary. It also fuelled the intrigue of why Trump's refusal to speak ill of Putin remains one of the few constants of his White House tenure. Did the two discuss issues that can lead to peace? "Tough to say," said Foreign Policy. "The two presidents have a 90-minute one-on-one on their schedules. Speaking briefly before they went behind closed doors, Trump told reporters they would 'have discussions on everything from trade to military to nuclear," but was light on details beyond that.'" Meanwhile in Helsinki Finn Church Aid executive director Jouni Hemberg expressed the hope that every high-level meeting will remind us that people throughout the world have the right to live in peace. "Peace is the foundation on which everything else is built," Hemberg said. "It is up to all of us to promote peace and justice in this world."